It's easy enough to feel alienated as a child without also needing a prosthesis — kids can be less than kind. Which is why I love what this inventor is trying to do to make an empowering superhero prostheses come to life. 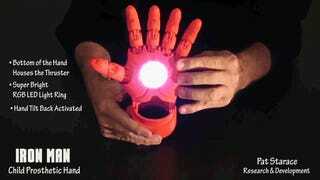 Pat Starce has three goals in mind for his child-sized Iron Man Prosthetic Hand. "It had to look awesome...it had to perform awesome and there would be no strings or mechanics that could distract from the visual impact." 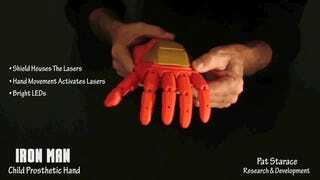 The result is a fully functioning 3D-printed hand with functioning lights to make a kid feel like the badass Iron Man they really are. He even took the extra step and articulated the fingers so they lock into that that iconic thruster pose! For more info on Pat's work, go here. Parents who want to reach out can contact him here.